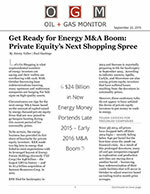 Let’s Go Shopping is what unprecedented numbers of energy investors are saying and their wallets are overflowing with cash. With October borrowing base redeterminations looming, many upstream and midstream companies are hanging For Sale signs on high-quality assets. 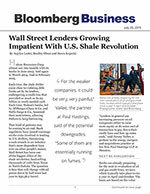 Banks are already preparing for the next reevaluation of oil and gas credit lines, reviews which typically take place twice a year in April and October. Halcon Resources Corp. almost ran into trouble with its banks in June 2013. And again in March 2014. And in February 2015. 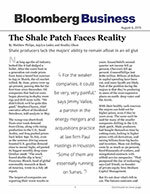 Each time, the shale driller came close to violating debt limits set by its lenders, endangering a credit line that provided as much as $1.05 billion in much-needed cash. Each time, Halcon’s banks, led by JPMorgan Chase & Co. and Wells Fargo & Co., loosened their restrictions, allowing Halcon to keep borrowing.